28. If the principal chief or chiefs of the Five Nation lndians Confederation disregards (this) constitution of the Five Nation Indians, then his female relatives will come to him and warn him or they to come back, and walk according to this constitution. If he or they disregards the warning after the first and second warnings, then she will refer the matter to the war chief, and the war chief will now say to him: “So, you did not listen to the warnings, now it is just where the bright noonday sun stands and it’s before that sun’s brightness I now discharge you as a chief and I now dispossess you of the office of chieftainship. I now give her the chieftainship for she is the proprietor, and as I have now discharged you as a chief, so you are no longer a chief, you will now go where you want it to go, and you will now go alone, and the rest of the people will not go with you for we know not of what kind of a spirit has got in you, and as the Great Spirit could not handle sin, therefore he could not come to take you out of the presence in the place of destruction, and you will never be restored again to the place you did occupy once.” Then the war chief will notify the Five Nation Indians confederation of his dismissal and they will sanction it. 29. Kariwhiyho, the good message is the love of the Great Spirit, the Supreme Being. This Kariwhiyho is the surrounding guardian of the Five Nation Indians Confederation principal chiefs. And this Kariwhiyho, it loves all alike the members of the Five Nations Indians Confederation, and other nations of Indians that are attached to it through customary way of treaties, and if the Five Nation Indians Confederation principal chiefs were to submit to laws and regulations made by other people, or course he or they the chief or chiefs are now gone through outside the boundary of the Kariwhiyhos surrounding guard, but their chieftainship fell off from their heads, and it remains inside the Five Nation Indians Confederation, and he or they are now gone outside of the Kariwhiyho’s surrounding guard alone without his or their chieftainship, the emblem of his or their chieftainship, their authority and honour. Among the Haudenosaunee (Iroquois – that is to say the Mohawk, Cayuga, Onondaga, Seneca, the Oneida, and the Tuscarora) the Great Law of Peace is the oral constitution whereby the Iroquois Confederacy was bound together. The law was written on wampum belts, conceived by Dekanawidah, known as The Great Peacemaker, and his spokesman Hiawatha. The original five member nations ratified this constitution near modern-day Victor, New York, with the sixth nation (the Tuscarora) being added in c. 1722. The laws were first recorded and transmitted not in written language, but by means of wampum symbols that conveyed meaning. In a later era it was translated into English and various accounts exist. The Great Law of Peace is presented as part of a narrative noting laws and ceremonies to be performed at prescribed times. The laws called a constitution are divided into 117 articles. The united Iroquois nations are symbolized by an eastern white pine tree, called the Tree of Peace. Each nation or tribe plays a delineated role in the conduct of government. Attempts to date the founding of the Iroquois Confederacy have focused on a reported solar eclipse, which many scholars identify as the one that occurred in 1451 AD though some debate exists with support for 1142. Barbara Mann has gathered version featuring conflicting but harmonized elements (who does what varies but what happens is more consistent than not,) or stories that tell distinct elements not shared in other versions, into a narrative she includes in the Encyclopedia of the Haudenosaunee published in 2000. An untranslated version has been posted by the Smithsonian Institution. Another is mentioned being presented to Michael Foster. There are several Mohawk versions that made it into print and several of those were printed more than once. Horatio Hale published one in 1883 he traced somewhat earlier which was reprinted by William N. Fenton, following Arthur Caswell Parker, in 1968. J. N. B. Hewitt published one in 1928 based on a much earlier fragment. Joseph Brant and John Norton commented on details of the narrative as early as 1801 and published since. Dayodekane, better known as Seth Newhouse, arranged for some versions that were published differently near 1900 – first from 1885 included in a book by Paul A. W. Wallace in 1948, and a second version published in 1910 by Arthur C. Parker.] Fenton discusses Newhouse’ contributions in a paper in 1949. Wallace also published a separate book without stating his source in 1946 called “The Iroquois book of Life – White Roots of Peace” which was later revised and extended with endorsements by Iroqouis chiefs and an Iroquoian historian John Mohawk in 1986 and 1994. Oneida versions have been noted in various places. One from New York, has been echoed/summarized by the Milwaukee Public Museum. Another has been published by the Oneida Nation of Wisconsin in two sections. Another account is also reported. Paula Underwood, an oral historian who traces her history to an Oneida ancestor, was also related to Benjamin Franklin. Her familial oral history describing Shenandoah’s close relationship and collaboration with Benjamin Franklin on the writing of the US Constitution was published in 1997. Parts of Horatio Hale’s work The Iroquois Book of Rites is said to have Onondaga sources. J. N. B. Hewitt recorded Chief John Buck and included his presentation in 1892. John Arthur Gibson shared several versions that have gathered notable awareness among scholars like Fenton and others. His first version was in 1899. Gibson then participated in a collective version with many Chiefs from the Six Nations of the Grand River Reserve in 1900 which was reprinted a number of times: first in 1910/1, and then included in another work. A final version was offered to Alexander Goldenweiser but wasn’t finished translated and published until 1992 by Hanni Woodbury. Newspaper editor William Walker Canfield published a book The Legends of the Iroquois in 1902 based on found notes he was given purporting to be written from comments of Cornplanter reportedly to an employee of the surveyor company Holland Land Company, perhaps John Adlum, known friend of Cornplanter. It is the primary source of the mention of a solar eclipse. Another Seneca version was given by Deloe B. Kittle to Parker and was published in 1923. There is a version attributed by Wallace “Mad Bear” Anderson of the Tuscarora published in 1987. However, there is a claim this was borrowed. Franklin circulated copies of the proceedings of the 1744 Treaty of Lancaster among his fellow colonists; at the close of this document, the Six Nations leaders offer to impart instruction in their democratic methods of government to the English. Franklin’s Albany Plan is also believed to have been influenced by his understanding of Iroqouis government. John Rutledge of South Carolina, delegate to the Constitutional Convention, is said to have read lengthy tracts of Six Nations law to the other framers, beginning with the words “We, the people, to form a union, to establish peace, equity, and order…” In October 1988, the U.S. Congress passed Concurrent Resolution 331 to recognize the influence of the Iroquois Constitution upon the American Constitution and Bill of Rights. The extent of the influence of Six Nations law on the U.S. Constitution is disputed by other scholars. 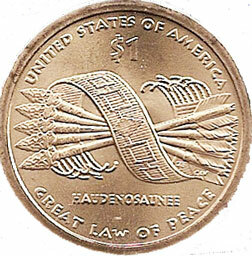 Haudenosaunee historian Elizabeth Tooker has pointed to several differences between the two forms of government, notably that all decisions were made by a consensus of male chiefs who gained their position through a combination of blood descent and selection by female relatives, that representation on the basis of the number of clans in the group rather than the size or population of the clans, that the topics discussed were decided by a single tribe. Tooker concluded there is little resemblance between the two documents, or reason to believe the Six Nations had a meaningful influence on the American Constitution, and that it is unclear how much impact Canasatego’s statement at Lancaster actually had on the representatives of the colonies. Stanford University historian Jack N. Rakove argued against any Six Nations influence, pointing to lack of evidence in U.S. constitutional debate records, and examples of European antecedents for democratic institutions. Journalist Charles C. Mann has noted other differences between The Great Law of Peace and the original U.S. Constitution, including the original Constitution’s denial of suffrage to women, and majority rule rather than consensus. Mann argues that the early colonists’ interaction with Native Americans and their understanding of Iroqouis government did influence the development of the U.S. constitution and the Suffragette movement. §37: There shall be one war chief from each nation, and their duties shall be to carry messages for their chiefs, and to take up arms in case of emergency. They shall not participate in the proceedings of the Council of the League, but shall watch its progress and in case of an erroneous action by a chief, they shall receive the complaints of the people and convey the warnings of the women to him. The people who wish to convey messages to the chiefs of the League shall do so through the war chief of their nation. It shall always be his duty to lay the cases, questions, and propositions of the people before the council of the League. §58: Any Chief or other person who submit to Laws of a foreign people are alienated and forfeit all claim in the Five Nations. §101: It shall be the duty of the appointed managers of the Thanksgiving festivals to do all that is needful for carrying out the duties of the occasions. The recognized festivals of Thanksgiving shall be the Midwinter Thanksgiving, the Maple or Sugar-Making Thanksgiving, the Raspberry Thanksgiving, the Strawberry Thanksgiving, the Corn Planting Thanksgiving, the Corn Hoeing Thanksgiving, The Little Festival of Green Corn, the Great Festival of Ripe Corn, and the Complete Thanksgiving for the Harvest. Each nation’s festivals shall be held in their Longhouses. §107: A certain sign shall be known to all the people of the Five Nations which shall denote that the owner or occupant of a house is absent. A stick or pole in a slanting or leaning position shall indicate this and be the sign. Every person not entitled to enter the house by right of living within upon seeing such a sign shall not enter the house by day or by night, but shall keep as far away as his business will permit.